They say it’s an ill wind which blows no good. On Murter, we firmly disagreed. 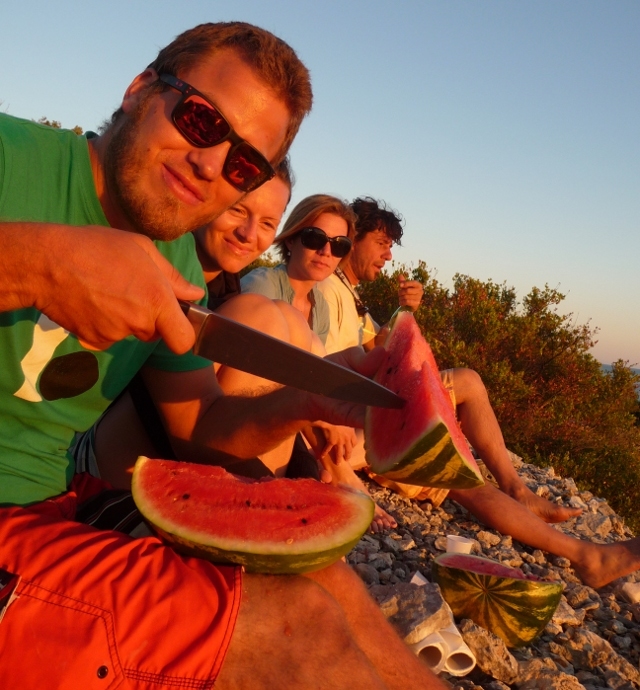 Murter, we’d heard, was a very pleasant little island, between Šibenik and Zadar. Since it’s joined to the mainland by a bridge, so no need for another expensive ferry, we thought it worth a look. Over we crossed, and bimbled along the island looking for a nice campsite. We passed a few, some looking fairly pleasant, some looking a bit sprawly-corporate. We’d heard good things about one site, at the far end of the island, just outside the eponymous town. We arrived, and found a narrow road along the back of a beach, lined with tat stalls, bars and waterslides. Not promising. The site itself was nice, if a bit bigger than we were expecting – kind of like the Mala Milna site we’d stayed at on Hvar, in that it formed a long backing line to the rocky seafront, but much bigger. The site was heavingly full, primarily relatively locally registered cars – lots of Croatians for a big national holiday weekend, but also a lot of Slovenians, Czechs, Slovakians. We parked by reception, and wandered along to see if there was a decent pitch free. One looked very promising, so whilst Ellie stood in it, I jogged back to the van. Off came the bikes, and we wandered into town for a look-see. The town’s nothing particularly spectacular, and the boat excursions to the Kornati Islands National Park, just across the water, sounded a bit insipid and poor value – b’sides, we’d need to hang around for another couple of nights to do them, since they weren’t running the following day, and we were only really planning a one-or-two nighter here. We got back to the site, and found a Czech couple had moved in to half of our pitch. 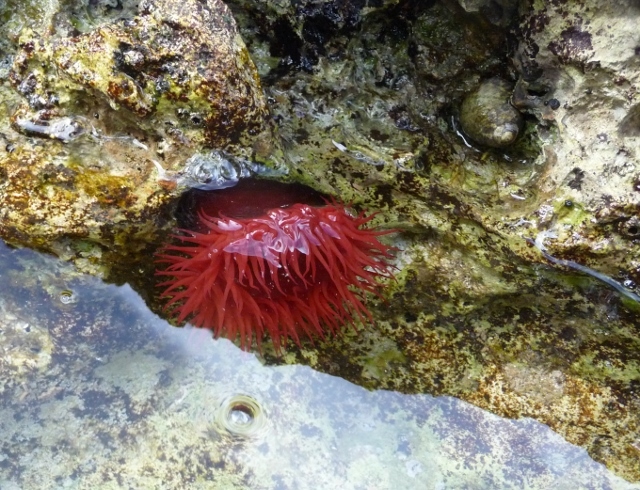 It wasn’t really a great problem, since the pitch was certainly long enough, but… A quick dip didn’t do much to endear the place to us, either – the water might have been beautifully clear, but it was home to a very large number of Sea Urchins. Ellie cursed – she’d managed to brush against one, and got spined. We headed out of the water, and eventually managed to remove the spine – like a very sharp wood splinter, but very fragile, not dissimilar to a thin ceramic fragment. If you’re not careful they crumble as you try to work them out with tweezers or a needle. 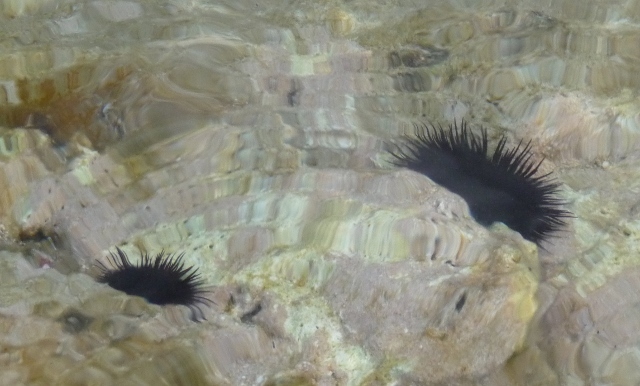 It was about that time that I realised that I’d not just stubbed my toe on a rock, but had two spines firmly embedded… They weren’t even the edible variety that we’d seen so frequently in Sicily. To add insult to injury, as we sat there the wind started to rise, causing the awning on the Italian fridge-freezer next to us to look more than a bit precarious. Nobody was home, so with visions of their return being to a mess of twisted aluminium and plastic, I had a quick look to see if anything could be done. The guy from the pitch on the other side of them was having similar thoughts. We’d barely started, when we were joined by a third guy, camped just the other side of the main roadway. It didn’t take long to bodge together a tool to wind the awning in, standing on their step on tip-toes (the usual long handle was nowhere to be seen), and with a job well done, we all introduced ourselves. Peter and Alenka were from Ljubljana, whilst Yankee and Maja were from Zagreb. We all just got on like a house on fire. We chatted for a while, during which time Yankee suggested a solution for our spined toes. Pee on our feet. Apparently, it softens the spines… You could say that that broke the ice… An arrangement was made to meet up after we’d all eaten – but, somehow, it didn’t happen. As the evening wore on, Ellie turned in, whilst I sat there to finish my glass of wine. Two hours later, still with the same full glass in front of me, I woke up… No matter, we’d all go for a coffee before Ellie and I headed. That coffee turned into a couple of beers, and we were staying another night. Oh, well. Our impossibly deeply tanned, glamorous and stylish Italian neighbours had returned from their boat trip, and were thankful for our rescue efforts. We ate, then the six of us just happened to meet up on the rocks, watching sunset. Drink appeared, and just as quickly disappeared. She’d gone to buy the Travarica! In the morning, we were ready to pack up and leave. Yankee and Maja were also planning to leave, since Maja had to work – but a quick phone call put that right, and suddenly we seemed to be staying another night, too… Peter had a huge gas-fired griddle with him, the sort of thing that wouldn’t look out of place in a diner, so we headed into town with Yankee in search of meat to cook on it. Back we trotted, arms laden with almost everything barbecueable from the thoroughly denuded supermarket shelves – it was, of course, yet another scorching day somewhere in the low-to-mid thirties. As the sun set, we all headed up a path at the back of the campsite, up onto the top of the hill behind. 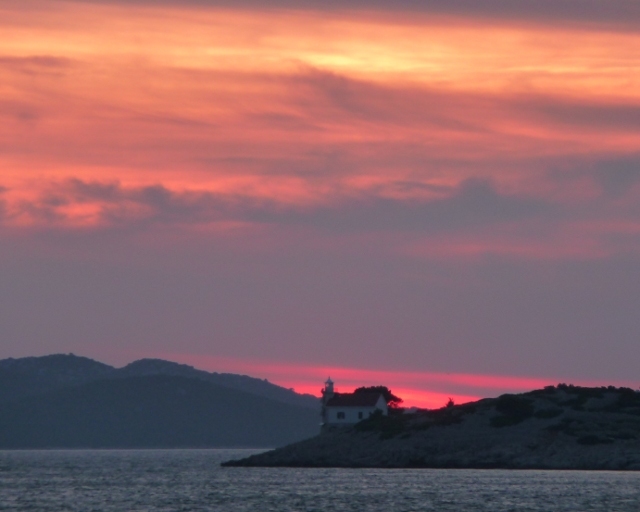 The view across the water to the Kornati Islands was truly astonishing – but we’d narrowly missed the best of the light. The sound of umpteen salads and grillable vegs being prepared was laced with yet more laughter, and eventually Peter fired up the grill. After that, there was no hope that we’d be packed and departing that morning, was there? Another phone call to Maja’s boss brought good news – six for dinner, again. One of Ellie’s curries made good use of the leftovers from the barbecue, but whilst that simmered and melded, we all headed back up that hill to catch the actual sunset. This time, we did not go empty handed, either – the seventh member of the group as we ascended the hill was a 10kg watermelon. Only six of us came back down. As the light failed, our singing voices did likewise – we thoroughly murdered almost every big-haired rock anthem and feel-good ballad we could think of. Whilst Maja chopped and prepped umpteen salads, Alenka did battle with the breeze to get two big pans of rice to cook. 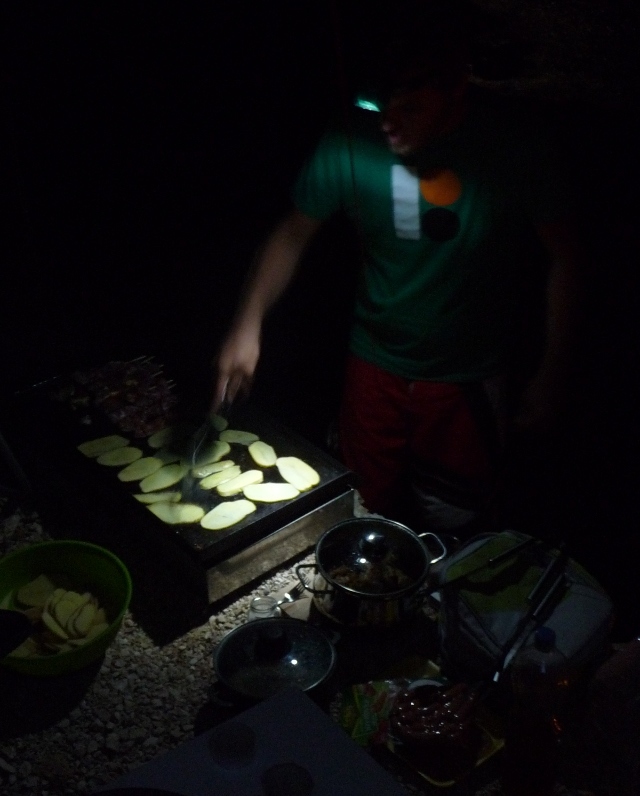 A tactical retreat soon saw the rice boiling away in the van, as the curry simmered on the flickering stove outside Peter and Alenka’s tent. Another feast, washed down with more Travarica and laughter until the wee small hours. The neighbours didn’t seem to have a problem with it – the Italians not only passed round beers as thanks, but left their outside light on for us. There was to be no more delaying our departure. We needed to be heading further, and both Maja and Yankee really did have to work that evening. Peter and Alenka were staying on, but – somehow – you knew it wasn’t going to be the same for them. We’d only known our new friends for three days – easily three of the best days of the trip so far – but it felt like we’d been together for years. Lumps were in throats, tears were in eyes. When Maja said “We have something for you…”, and made us pick a hand per couple, it didn’t help. 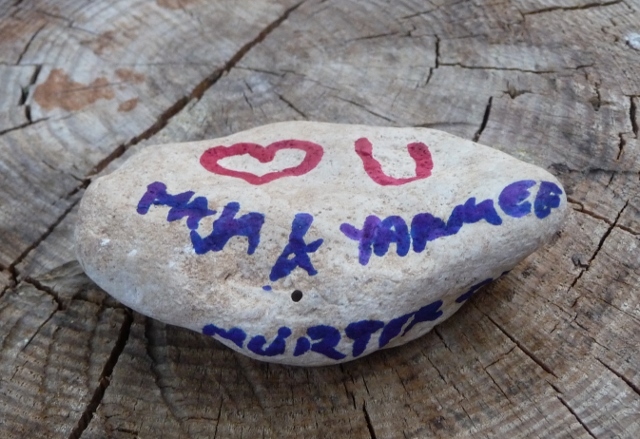 Out came a pair of pebbles from the hillside, painted with a little farewell message. Farewell? No. Details were, of course, exchanged. Facebook friendships were accepted. Kind offers of guided tours of home cities were made. Those were not the hollow words of a holiday acquaintanceship, and they were not accepted with empty promises soon forgotten. This entry was posted in By Country - Croatia, Food stuff, Personal stuff, Travel stuff. Bookmark the permalink.